This post is part 1 of a 6 part series. Please read the Marriage Equality is HERE: What does your marketing say about your company? (A special 6 part series) to find out what other topics are part of this series. Whenever I am browsing the internet for LGBT related news, I usually come across a myriad of advertisements that are attempting to position themselves toward the LGBT community. And when I say position, I mean they put a rainbow flag behind their mainstream ads and advertise in the same way that they always do. But what always strikes me is what is marketed and what isn’t. You’ll see luxury cruises, five star hotels, fine jewelry, credit cards, and an array of high-end commodities. It’s not so common to see your every day items or brands that are attainable to the masses. I often wonder where these folks advertising get their advice. They are clearly operating under the assumption that the LGBT (and more specifically, the gay) community is more affluent than other communities. To most people in the LGBT community this should seem like common sense, seeing how many states do not even provide basic workplace protection for the community, but the idea that LGBT people have bags of money is a myth that still gets tossed around regularly today. What is your product’s target market? LGBT people are, first and foremost people, and people have lots of needs and wants. Whether you’re looking to sell insurance, jewelry, real estate, cupcakes or anything in between, have a clear idea of the socioeconomic community your product is aimed at. Rather than assuming the LGBT community is a homogeneous mass, go through your client database and look for commonalities in age, gender, and sexual orientation. If your product is geared towards younger, single LGBT people, sponsoring events and advertising in venues geared towards that demographic would be your best bet. If it’s primarily older, more affluent couples, than modify your marketing strategy accordingly. Targeting your campaigns to the diverse needs of the LGBT community is a key in building a solid marketing plan and setting yourself apart from the competition. How well do you know the target market? It’s an easy thing to crunch data and find commonalities in your client database, but figuring out what it is exactly that attracts specific demographics to your business is a different game altogether. What are the professions of your target market, what are their concerns with your product, and how can you address them specifically? Someone in their teens and early twenties may be thinking about short term goals and ways to have fun, but someone older will be more likely to consider long term investments, and thus be a long-term consumer. Try to survey your consumer base and ask them questions about what it is they’re interested in and the types of benefits they see out of obtaining/using your product. Once you have identified who you are targeting and how well you know them, you can begin formulating very specific outreach plans to each of their specific needs. What appeals to a retired gay couple will be different than what appeals to a young single lesbian. Don’t be fooled by the umbrella term of the LGBT community. Those who are marketing to specific segments within the LGBT sphere are going to be the folks who see the biggest return on their investments. Where can I reach my target market? Once you’ve figured out who it is that you’re marketing to, the next step is figuring out where to find them. Like I previously talked about, some advertisers utilize a carpet-bombing approach with the LGBT community, inundating every vaguely LGBT website and newspaper with the same ads. This approach, while it may have merits, is far too costly and unwieldy for most small and medium sized businesses. Try to figure out what magazines they’re reading, what radio stations they’re listening to, and what sorts of events they’re attending, and meet them there. I can tell you that I read a mix of business publications and LGBT publications. If I see an advertiser in Boston Spirit Magazine or The Rainbow Times (both monthly reads for me), that has a certain level of appeal that they are marketing to the LGBT community. But if I see those same advertisers with an LGBT inclusive ad in Entrepreneur, Fast Company or Inc, then that sends up an entirely different message. Being inclusive in your mainstream advertising is going to take the cake any day. I wrote a previous blog post about Inclusion Based Marketing, read here for more info on how to be inclusive in your efforts. What can I do for the LGBT community? To really have a lasting impact on your target market (especially an LGBT-related one) it’s important to show that you care about them as more than just a series of statistics. Showing your support through financial contributions, sponsoring events, and being an active participant and ally to the community are all ways you can demonstrate a long term commitment to helping LGBT people as well as your target demographics. And building trust means your consumers will be more loyal to your brand, creating a situation where everyone benefits! The fly by night advertising approach where an advertiser just sprinkles some LGBT ads here and there and are never to be seen again do more harm than good. To market to the LGBT community you need to make a commitment and a long-term investment in making the community stronger. It’s not just about the dollars and cents although that will come along with properly reaching out to the community. Remember, as an advertiser, your concerns are not about yourself, but about the needs of the people you want using your product. The LGBT community needs social and economic support, and by working to build partnerships and strong consumer relationships, you’re doing work that is needed and appreciated. Don’t forget to show your appreciation in turn. Following these steps is easier said than done. But the value of showing you care and have a sense of social conscience will be well worth the effort, morally and financially. And most of all, think in the long-term. Marketing isn’t about your needs; it’s about showing that you understand the needs of your target audience. 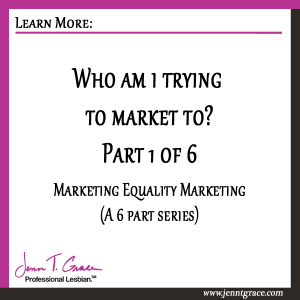 Being authentic, focused, and cognizant of who and where your target market lies is the best way to formulate a marketing strategy that will work for your business and for your target audience. And check out Part 2 of this series where we talk about differentiating yourself from the competition.